This is a very special post. 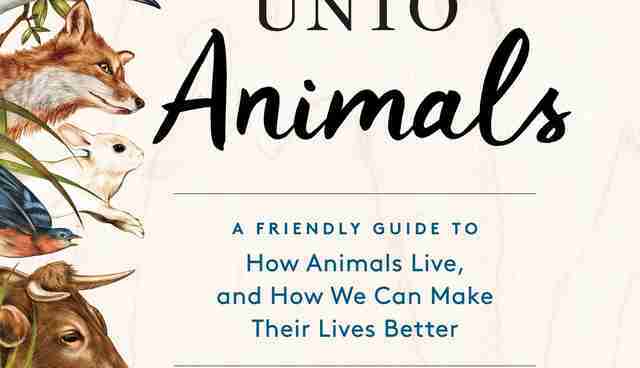 It was written by a Dodo Contributor, a member of our animal-loving extended family. 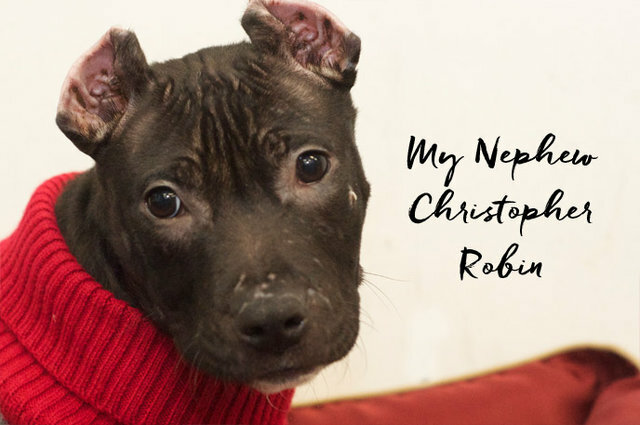 It was the week before Thanksgiving and my kids and I were volunteering at Animal Haven shelter in New York City when a precious puppy named Christopher Robin was brought in. Days earlier, someone had cut off Christopher Robin's ears with scissors and left him for dead in a garbage can. It was surmised that whoever had done this probably hadn't been happy with the results and considered the dog dispensable. I'd have to use too many curse words to describe what I think of this, so I will just go on from here. Christopher Robin was safe at the shelter, still very frail and frightened, when it was decided that a quiet foster home rather than a busy shelter was probably a better place for the initial phases of his recovery. This pup was going to need round-the-clock hugs, and luckily, my family of huggers was an approved animal foster family. We brought Christopher Robin to my house, which was about to be full of tenderhearted suckers arriving for a holiday feast. It was there that I'd launch my diabolical plan to keep Christopher Robin in my extended family. I knew that my sweet friends and family would be fighting over who was going to give Christopher Robin his forever home - and indeed that is exactly what happened! Christopher Robin suffered horribly from the barbaric removal of his ears, and throughout his life there will be times where he will be unfairly judged because of how he looks. 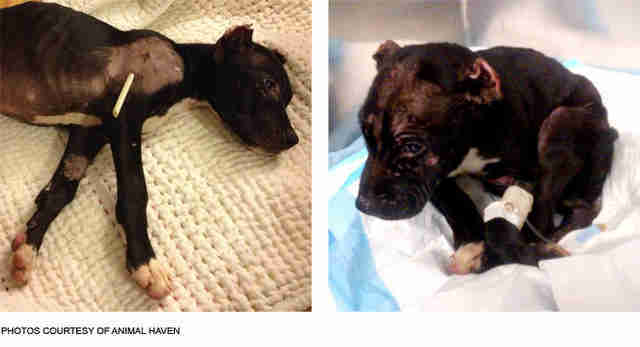 People may assume that he is an aggressive fighter, as dogfighters cut off (crop) dogs' ears to make them less vulnerable in a fight. Other dogs may view stiff, immobile ear nubs as an indication of impending aggression, so these dogs can be at greater risk of being attacked. It's hard to imagine the kind of cruelty Christopher suffered at the hands of a scissors-wielding human. Sadly, though, formal surgeries to crop dogs' ears and dock their tails (removing the hair from the tail before clamping and cutting it down to the desired length) happen every day in veterinary clinics. There has been no proven science to support the argument that these procedures prevent injury and infection. The decision to remove these vital appendages comes down to a fashion choice. Just as there's a purpose for every appendage on the human body, so it is for our dogs. Sometimes I even feel as though I could use more appendages, so the idea of removing any seems thoroughly misguided! You can start in your own home by making a promise not to put your furry family member through that pain. Discuss the issue with your family and friends. If your local veterinarian still performs this procedure, write a letter to him or her and explain why you'd like this practice not to happen in your community. Ask for the change you want to see. Write to local senators, representatives, and assembly members who have influence over the specific bills related to these issues. The Animal Legal Defense Fund is just one organization working to fight these issues and offering resources for getting involved and making a difference. 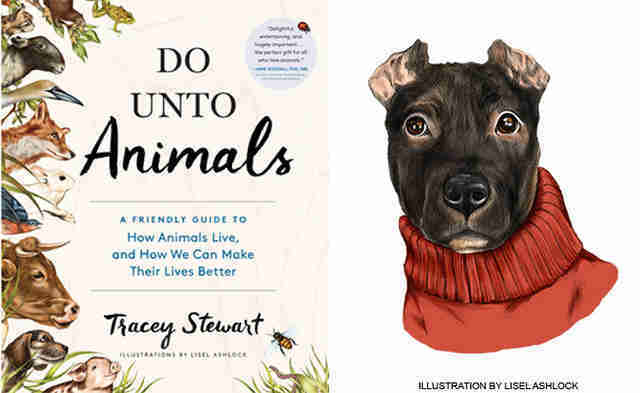 Excerpted from "Do Unto Animals" by Tracey Stewart (Artisan Books). Copyright © 2015. Illustrations by Lisel Ashlock Find out more about "Do Unto Animals: A Friendly Guide To How Animals Live And How We Can Make Their Lives Better" at Moomah.